I was sooooooooooo happy to find the recipe for Palak Patta Chaat on Inside Cuisine which was posted about two weeks ago. We got some Indian takeaway last weekend from our favourite Indian restaurant, Abhi's Indian where they serve absolutely delicious refined Indian cuisine. We had the Lamb Biryani, which was divine, and our favourite Palak Patta Chaat, which is described in the menu as "Spinach leaves in a crispy lentil batter, topped with yoghurt, date & tamarind and chilli & mint sauces". How can anyone not order that? I was a little disappointed though, that the prices on the menu keep going up. However, this crispy spinach entree was worth it, as I doubt I will attempt making it at home unless I was cooking for a party, perhaps. 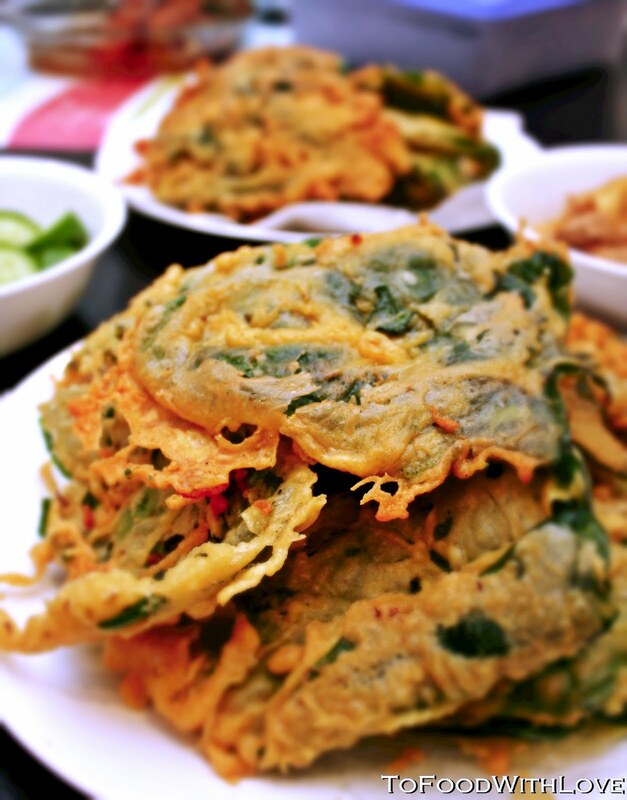 Making the deep-fried spinach itself is pretty easy. I already had a ready supply of besan / chickpea flour in the larder, and rice flour too (a pantry essential). I planned on using them for my rojak dish as I did not have any dough fritters ("youtiao"). These super crispy little things also make a great snack, and might be just the thing to get kids to eat spinach! Z and H happily helped out by patting the leaves dry between some paper towels, and then using a whisk to mix the batter in a bowl. Combine flours, chilli powder and salt in a bowl, make a well in the centre, then gradually add water and whisk until smooth. Cover and stand until required. Heat oil in a deep-fryer or wok to 180C. Dip spinach leaves, one at a time, into batter, shaking off excess, then deep-fry, in batches, until crisp and golden. Drain on absorbent paper. Serve immediately. They taste really good with just a squeeze of lemon juice! Note: Any leftovers can be stored in an airtight container. As chickpea batter doesn't stay crisp for long, just lay them out on a baking tray or foil and pop them into the oven under a hot grill for a minute or so, turning to ensure both sides are crisp. Be careful not to burn.